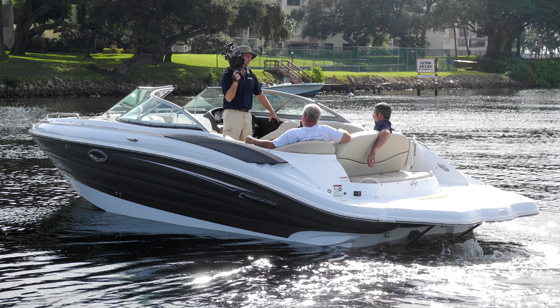 The 2019 Cruisers 338 Palm Beach Edition Bow Rider brings an opulent luxury to its largest runabout. 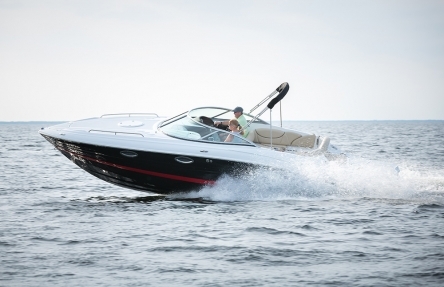 Here’s a little something to consider when shopping for your next runabout: Limit your search to companies that also make yachts. Think about it. It’s reasonable to assume yacht buyers would insist on a certain level of luxury and quality. 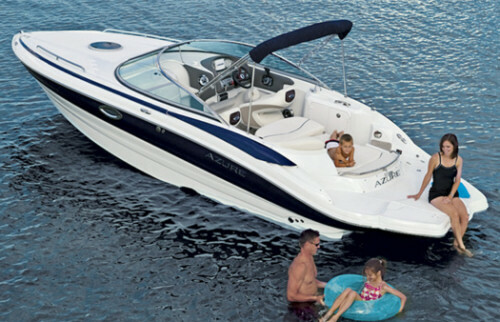 And if that same company builds runabouts, it’s also reasonable to think some of that same luxury and build quality would trickle down to the smaller boats it builds. 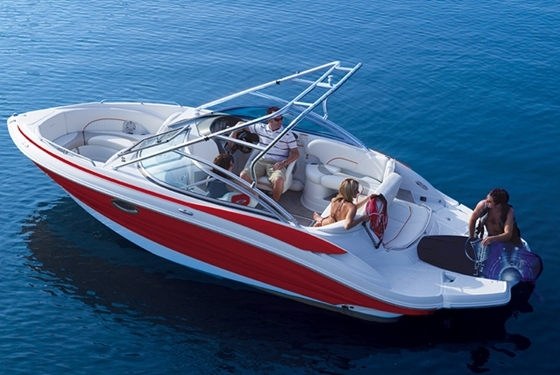 With that in mind, let’s look at the Cruisers Sport Series 338 Palm Beach Edition Bow Rider. Take the stern lounge and swim platform on the 338 for example. It serves as an aft lounge that faces the interior, but it also has an aft-facing bench that overlooks the swim platform, which comes in standard form or an optional platform that extends and additional 3 feet. Then at the touch of a button, it converts to a full sun pad with a headrest that can be raised at the rear. 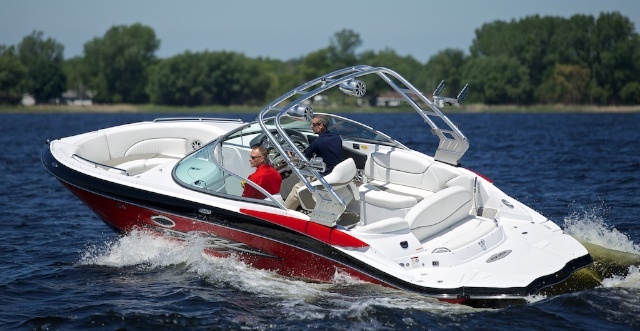 It’s a yacht-like quality, which continues throughout the cockpit and especially the helm. It’s laid out smartly, with an array of analog gauges up top, navigation display to the left of the wheel and controls to the right, flanked by toggle switches. The intricate details are hard to miss on this outboard-powered bow rider—built by a luxury yacht builder whose trickle down effect is definitely noticeable. 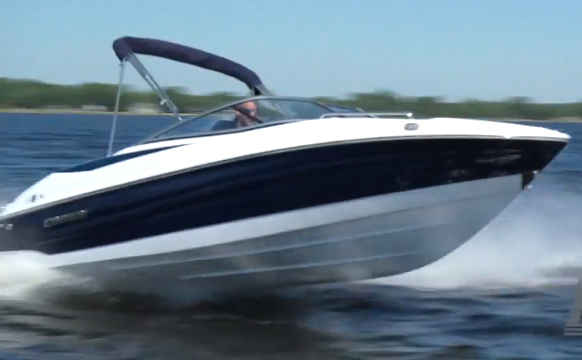 The 338 is a bow rider, but it also has a mid-cabin with a bamboo-wood-like veneer, nice wide lounges and an enclosed head compartment. The head includes a sink, commode and a shower system. The bow area is unique too, in that you step down into it. There’s stowage beneath the step, the deck and a removable cooler in the forward-facing seat. A dinette table pops in place in a deck receptacle and there’s a full anchor locker up front. The anchor features a windlass assembly that feeds through the forward-most section of the hull rather than over the top of the deck, which creates a cleaner profile and doesn’t drag seaweed up onto the deck when you retrieve the anchor. Again, lessons learned in building yachts. It would be difficult to outline all the features of the 338 in the space we have, but the importance of the lessons learned in building yachts can’t be understated. With its elegant lines and black cherry gelcoat, the 338 Palm Beach edition is somewhat understated, yet makes a bold statement at the same time. 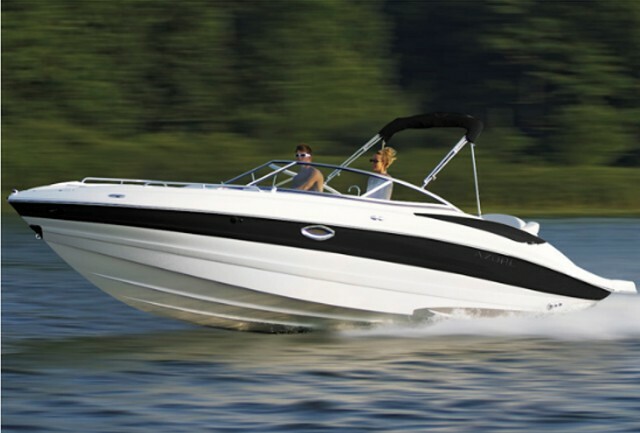 See all Cruisers Yachts 338 Bow Rider listings.